(b. 1976) has taught music from kindergarten to college in styles from madrigal to mariachi, and strives to make beautiful music for and with captivating people. He has climbed mountains, saved someone’s life, and watched the moon rise over the prairie. He has loved, lost, and loved again; helped friends find salvation, and found it for himself as well; taught genius students, and learned from genius teachers. On the day his son Noah was born, he gave him his first shampoo, and looks forward to teaching him to catch a baseball and ride a bicycle sometime around 2015. Just as he met his daughter Melia for the first time, there was a magnitude 4.5 earthquake, and his life changed again. His dreams are to walk on Mars, hear a grand piano fall into an orchestra pit, make more people laugh than cry, and love his wife Becky passionately and forever. He plays trombone and is always getting better at playing piano, and in the course of a long, love-filled, productive life, he wants to compose the Great American Symphony, ride the rails, hike the trails, read all of the good books, finally watch The Godfather, and storm the castles in the air. He will never write unlistenable music, stop stargazing or lose money in Vegas. He doesn’t call his mother often enough, but he still tries to do a good turn daily. He is always up for a few hands of euchre or a good game of chess, likely winning the former and losing the latter. Dr. Saunders is the music department chair and Professor of Music at Lakeland Community College, where he teaches music theory and the history of popular music, and directs the Lakeland Civic Orchestra. 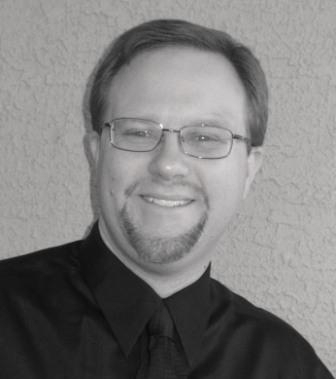 Prior to coming to Lakeland in 2012, he held the position of Associate Professor of Music and Director of Bands at Oklahoma Panhandle State University from 2007 to 2012. He received degrees in music from the University of Cincinnati College-Conservatory of Music and The Ohio State University. Dr. Saunders studied composition with Donald Harris, Thomas Wells, Jan Radzynski and Wes Flinn, and trombone with Joseph Duchi and Tony Chipurn. His fourteen years’ experience in music education includes teaching band, general music and music theory in public elementary, middle, high schools, colleges, and universities in rural, suburban and urban settings in Ohio, Georgia, and Oklahoma. Dr. Saunders’ original compositions have been performed across the country, including performances at national conferences of the International Horn Society and the Society of Composers, and he has presented his research on rhythm at conferences of the College Music Society and the Society of Composers, and at the Oklahoma Music Theory Roundtable and the Aspen Composers Conference. He was the conference co-host of the 2012 Society of Composers Region VI Conference, held at West Texas A&M University in October 2012. He received the 2007 Ruth Friscoe Prize for composition and was the Oklahoma Music Teachers Association 2011 Commissioned Composer. His music is published by Imagine Music, and he has written articles for The Journal of Band Research, Music Educators Journal, The Chronicle of Higher Education, and The Instrumentalist. He is on the web at www.martiandances.com, but the physical Dr. Saunders lives in Willowick, Ohio with his wife Becky and their children Noah and Melia.